Mouse anti 6xHistidine Epitope Tag HIS.H8 / EH158. Product is tested for Immunoprecipitation, Enzyme Immunoassay, Dot blot, Western blot / Immunoblot. 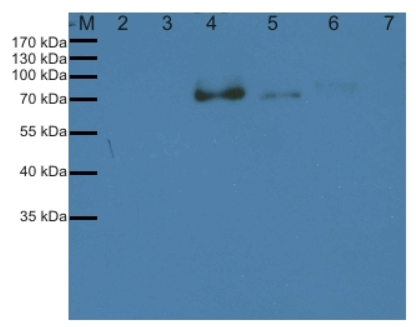 western blot (WB), dot blot (Dot), ELISA (ELISA), immunoprecipiation (IP), immunlocalization (IL). working dilution for ELISA, IL and IP needs to be determined experimentally. 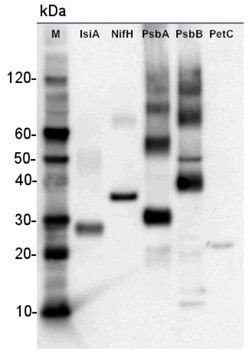 His-Tag is a polyhistidine tag which consists of 6 histidine residues introduced on N- or C-terminus of the protein. 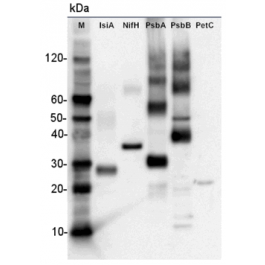 The polyhistidine-tag can be used for recombinant protein detection using specific antibodies. material adhering to the cap or sides of the tubes. 50 μg for reconstitution add 50 μl, of sterile water.